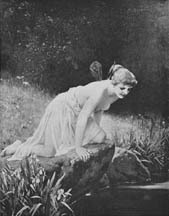 Psyche at Nature's Mirror (1893) by Paul Thumann, first published in Munsey's. 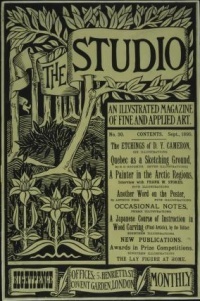 This is a poster for The Studio, an arts magazine first published in 1893. First performance of Maurice Maeterlinck's Pelléas and Mélisande. Krafft-Ebing first uses the term "homosexual"
In a letter to Franz Mehring, Friedrich Engels coins false consciousness: "Ideology is a process accomplished by the so-called thinker. 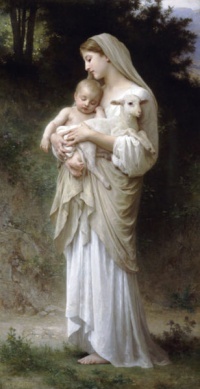 Consciously, it is true, but with a false consciousness." May 9 - In America, Thomas Edison holds the first public exhibition of films shot using his Kinetograph at the Brooklyn Institute. Unfortunately, only one person at a time could use his viewing machine, the Kinetoscope. G. A. Peirson, Human Monstrosities (Philadelphia: Lea Brothers, 1893). World's Columbian Exhibition of 1893 in Chicago . 'Psyche at Nature's Mirror' by Paul Thumann, first published in Munsey's December 1893 issue. Unless indicated otherwise, the text in this article is either based on Wikipedia article "1893" or another language Wikipedia page thereof used under the terms of the GNU Free Documentation License; or on original research by Jahsonic and friends. See Art and Popular Culture's copyright notice. This page was last modified 14:49, 10 September 2014.